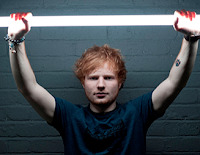 Ed Sheeran tattooed New Zealand radio personality Dominic Harvey live on the air today. The British singer/songwriter tattooed the image of a guitar (with his signature paw print) on the local radio DJ's arm. You can watch the video of Ed giving the tattoo below.